I really don't eat a lot of gluten free products ie bread/ biscuits etc, but I like the brand Dietary specials & usually have a packet of the brown ciabatta rolls in the cupboard a) because they're convenient when I have people over as they are tasty enough to get past gluten eaters unlike a lot of other Gluten free breads, b) they are so convenient to take with you if you are going away & don't know if there will be anything you can safely eat for breakfast. For the same reasons, I usually have some dietary specials bourbon biscuits or digestive biscuits in the cupboard, so that when friends come round I have something to offer them - or for those moments when ONLY tea & biscuits will do. Also the good thing about the biscuits are that they are packaged in two's or fours, so you don't have to open a whole big packet just to give someone a biscuit. Anyway, back to today's recipe! If you don't live in the UK or can't get hold of the above rolls, just use any gluten free rolls or bread of your choice. Handful of fresh basil chopped. 1 finely chop the white parts of the spring onions. drain the can of tuna, and mix the tuna and the spring onion with the mayonnaise. 2 split the ciabatta rolls in half and lay on a baking tray. 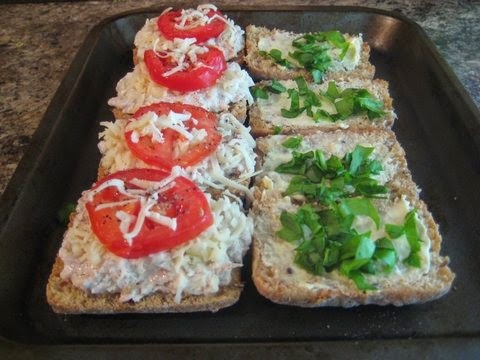 3 spread 3 halves with the tuna mix. sprinkle with grated cheese and top with some tomato slices. season with coarse ground black pepper. 4 bake in the oven for about 10 mins depending on how crispy you want the bread to be. Sandwich the two halves together and serve with soup! 1 peel, de seed and chop the butternut squash. Arrange in an oven proof dish. Drizzle with 1 capful of light olive oil (or other cooking oil of your choice). toss the veg around so its well covered. bake in the oven for around 40 mins until the squash is tender & cooked & starting to brown. Remove the vegetables from the saucepan (I used a slotted spoon) and discard. Make sure you don't lose any of the liquid because that is your stock! 3 Put the stock and the roasted squash into the blender and blitz. Season to taste. That's it - it's that simple! Made this way the butternutsquash flavour is so intense - but feel free to jazz it up with some chopped fresh sage, some chopped fresh coriander, chilli sauce, sauted onion, a spoonful of coconut cream, turmeric, garlic puree or anything else you like - but mostly I love it as it is with a bit of seasalt.